One of the very first posts on Stellar Four when we started it a year ago was Meghan's ode to Clockbot, a devastatingly cute robot with a clock in its tummy. Alas, the Anthropologie necklace was out of stock almost immediately. I lucked into one, but its swift sell-out left lots of people wishing they'd hit the "purchase" button a little more quickly. If you're still sad that you missed out on the Clockbot awesome-sauce, have I got some good news for you: Craft store Hobby Lobby is now selling a knock-off version! On the left is Hobby Lobby's version, and on the right is the original Clockbot. Sure, you've got to provide your own necklace chain, and I think the concave eyes are more appealing than the bulging convex ones, but at $8.99, it beats ol' Clockie's original asking price of $28. Plus, Clockie 2.0 is actually still available for purchase. 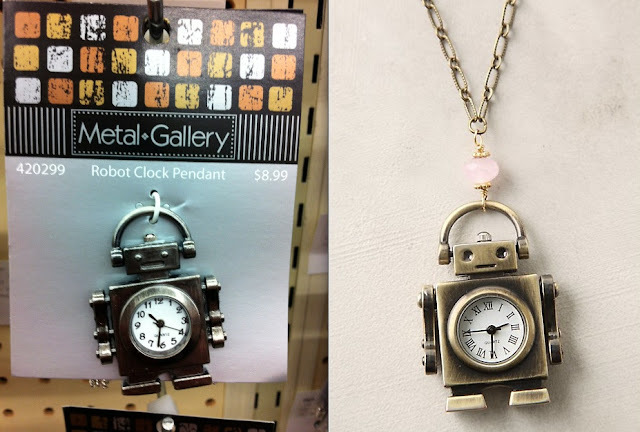 I get compliments on my Clockbot necklace all the time (the best one ever was from an early 20-something guy who asked: "Is that a ... robot? With a clock? In his stomach?"). I suspect you'll have the same luck with Clockie 2.0, should you decide to buy. Oooh, that one's even closer in appearance to the original AND is cheaper AND comes with a chain AND has free shipping. We have a winner!